In my former life, (before the glamour of food blogging) if you can believe it, I was a public school teacher! I taught with a lovely Argentinean woman named Carina, and we became fast friends. We pored over lesson plans together, graded papers together, and commiserated over our difficulties together. Though neither of us are teachers now, over the years our friendship has continued. Carina and her husband Julio are both from Mendoza, like Guillermo. They recently invited us to their home for a tutorial on how to make authentic Empanadas Mendocinas-Mendoza style empanadas. Now this was a lesson I wouldn't mind sinking my teeth into! The crusts (or shells) of the empanada are called tapas (think lids rather than appetizers) and are sold in most Latin markets in the frozen section. They come in packets of one dozen-the best brands are La Salteña or Goya. There are two styles of tapas-estilo criolla or estilo hojaldre (which is preferable because it has a flakier crust). If you are determined to make your empanadas entirely from scratch, Layla has a great tapas recipe. 12 empanada rounds (tapas) 1 egg, beaten, for glazing 1 glass water, to seal edges Note: The meat can be made a day in advance. In a medium saucepan, heat the butter over medium-high heat. Put the onions, sliced finely in rounds, in a frying pan and salt them. Saute until they start to become translucent, then add in the beef. Cook the ground beef, chopping as it cooks with a flat spatula to maintain ground beef texture. Add salt and pepper to taste. Cook until the beef has cooked through, then taste for salt and pepper, and stir in the paprika, cumin, and crushed red pepper and mix well. Pre-heat the oven to 400 degrees Fahrenheit. Put the tapas on a lightly floured work surface. With a tablespoon, put a little of the meat filling in the center of the dough round. Add a slice of the olive and a piece of the hard boiled egg. For sealing, you'll need a small glass of water. Moisten the edge on the top half of the round with a little water on your finger. Fold the bottom half of the dough up until the edges meet and seal with your fingers by pressing down. The empanada should have a half-moon shape. Use the palms of the hands to pack the filling firmly in the center. Next, fold the edges with the Repulgue: using your fingertip, fold one corner of the empanada over, pressing down firmly. Go to the edge again and repeat, pressing firmly each time. Go around the edge of the empanada and you'll get a spiral pattern. You can also use a fork-seal, instead. Beat an egg in a cup and paint the top of each sealed empanada so that when they bake, they have a shiny, golden shell. 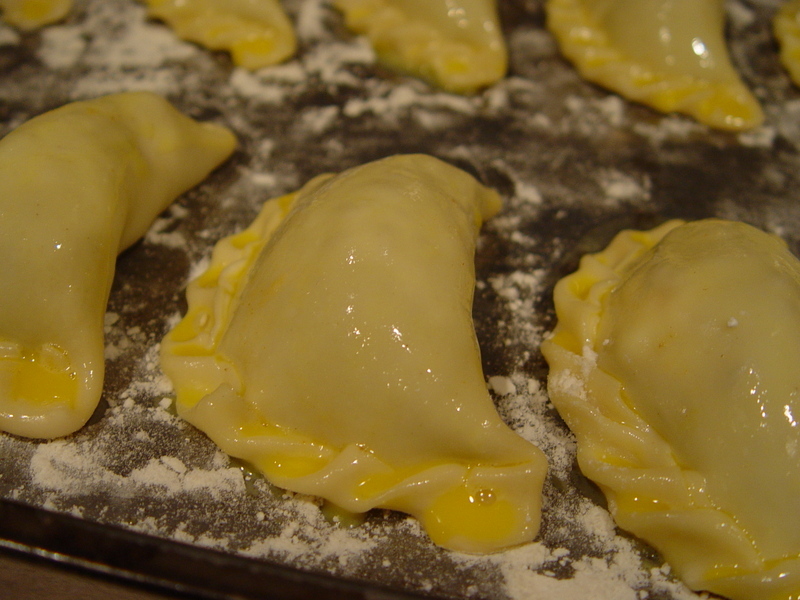 Spread flour lightly over several cookie sheets, and place the finished empanadas on top. 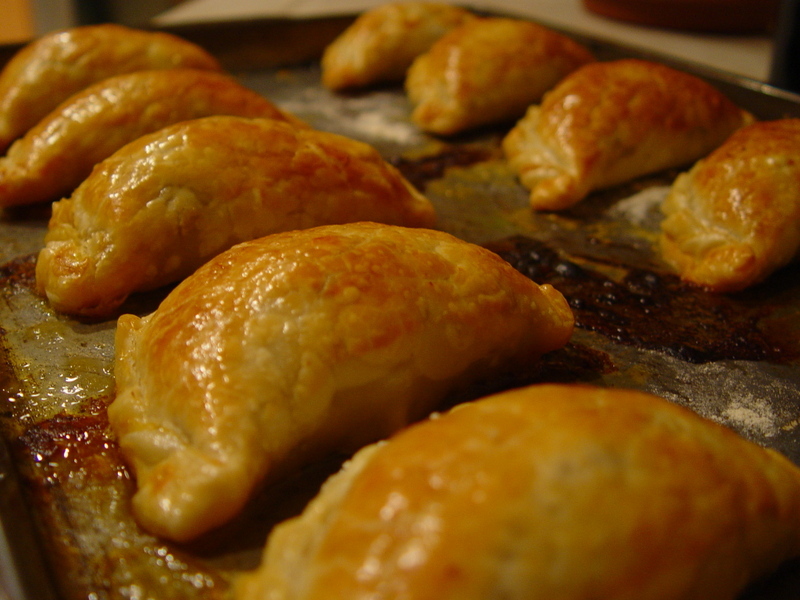 Put the empanadas in to bake for 12 to 15 minutes-they should be sizzling and very golden brown on top. Take out and eat very carefully while hot! Hi Sharon! I'm Sabrina from Argentina. You can freeze the empanadas without cook them. You just need to freeze them into a large pan without touching one with each other and then when the empanada is compleate frozen you can put them into a bag or a tupper. 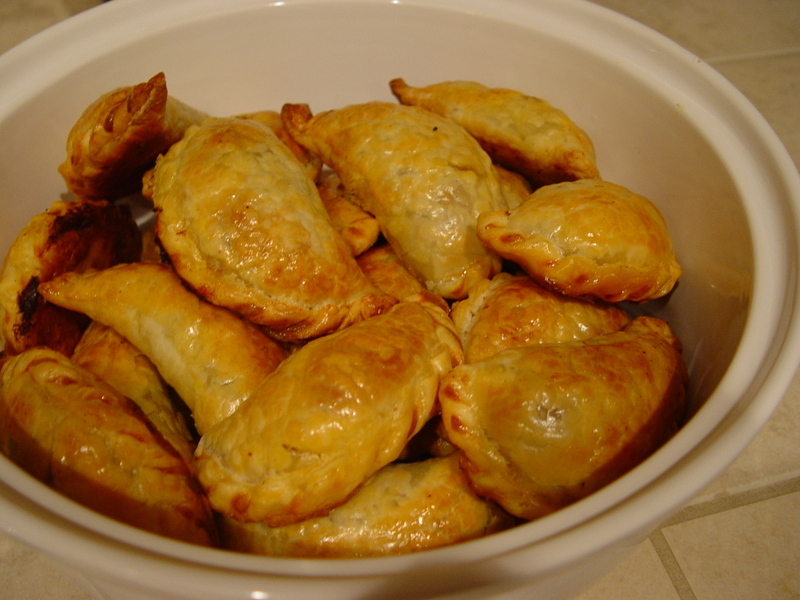 To cook the empanadas, please do not unfroze them, just place it in a cooking pan, without touching one with each other, and cook in a low oven, like 250 or less until golden brown. Wish you all the best in your new location. I want to make empanadas for a party of 40 people. Can you tell me if I want to make my empanadas ahead of time, will they taste as good if I bake them and then freeze them? Do you have any suggestions? hi Rebecca, is the empanada of the month event is still going on? I made empanadas today.. with curried potato, peas and chicken. will post it on my blog tomorrow. Would you put a link to my blog here? Hola! Por favor donde puedo conseguir tapas La Saltena en Long Island, ya que hasta ahora solo consigo Goya y la verdad es que no me gustan tanto..Gracias!!! i'm studying abroad in argentina right now and empanadas are defintely my favorite food here. i think that actually the majority of empanadas are baked (or at least that's my experience) regardless of where in the country there from. my favorite kind is carne cortado picante, which are especially good around six am after a long night in palermo. What a fun event! And those empanadas look incredible. Too bad I won't be able to participate this time around (I'm traveling), but I'll be sure to join in next time! Those empanadas look so good!! I've always wanted to make these! The video is fantastic and I just love the beautiful language that is being spoken! I watched it 3 times because it's so beautiful, but I only understand one word..."bueno"!...I think that means"good"! 1. i love things wrapped in dough. 2. any recipe calling for a pound of lard gets my attention. Gretchen-haha! Can't wait to hear your ideas, and I know you'll love making these! Lydia-I am amazed at the whole 'empanada culture'-so many fillings, so little time! Jen- ihope you participate in the event! Yum! Silvia-my husband says I'm a messy cook, too-but if you don't make a mess you don't get to eat! Hope you enjoy and thank you for your kind words. Laylita-I'm sure you will make some amazing empanadas! Send me some of your favorites-What are some Ecuadoran specialties? KG-We thought about licking the screen, ourselves! Ha! Gertrude-where in AR is your husband from? I bet he has had this type before. Shirley-great! Thanks for joining us! Brilynn-So glad you are going to make them! Kevin-thanks-a new recipe for you to test out! Those Empanadas look really goos with their perfectly golden brown crusts. I definitely wan to give these a try! This I have to try. Count me in. I love making this for my husband who is from Argentina. I will definitely participating in your Empanada of the month event. I will try out your recipe and thanks for sharing it with us. I'm having some of your cafe con leche right now and really need one of your empanadas to go with it. They look so good! I'm in a big empanada mood right now so I'll definitely be participating in the Empanada of the Month event. I adore your blog is so full of energy! Lovely empanadas! Thank you for the wonderful recipe. Beautiful empanadas, and the video is really helpful in explaining the spiral technique. I've made Mexican empanadas that are similar, and also baked rather than fried. This is perfect for me. I have a dream of doing different fillings for empanadas and you are going to push me into doing them, aren't you? And here I just though you were going to share an empanada each month, but you are actually going to make us work too! I think it is great, I am totally in. These sound just like Peruvian beef empanadas. Great thinking!